The Dropkick Murphys released their brand new album Friday, called "11 Short Stories of Pain and Glory." 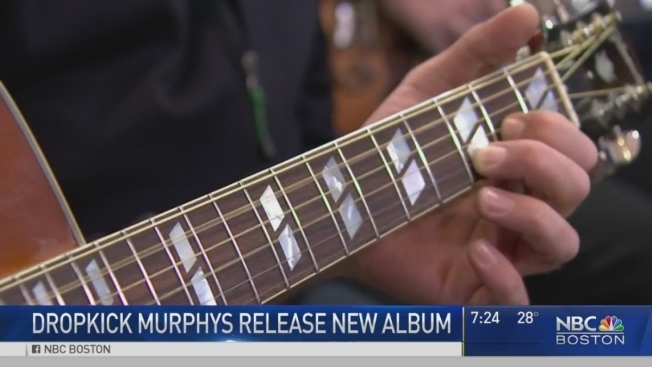 "It's our ninth album," lead singer Ken Casey said in an interview with NBC Boston. "We tried really hard to top anything we've ever done." In order to focus on writing and recording, the band travelled to Texas. What they created was an album deeply influenced by Massachusetts' opioid crisis. "It almost seems like I'd be lying when I say how many wakes I've been to," Casey said. "My 24-year-old cousin, you never would have thought it would happen to her. One of our band members lost his brother-in-law. It's nonstop." In fact, the second single on the album is a cover of a classic song that Casey heard after leaving a wake. It's called "You'll Never Walk Alone." In this NBC Boston exclusive, The Dropkick Murphys perform "You'll Never Walk Alone," one of the songs on their upcoming album, "11 Stories of Pain and Glory." "The song came on random, on shuffle," Casey said. "I was thinking, 'Wow, it's such an inspirational song.'" "Paying My Way", the third single, is all about the hope in recovery. Five of the band's seven members played both songs for NBC Boston in an exclusive jam session in their South Boston rehearsal space. In this NBC Boston exclusive, The Dropkick Murphys perform "Paying My Way," at their South Boston rehearsal space. The band doesn't just sing about the crisis, though -- they're also working to help people affected by it. Their foundation, called the "Claddagh Fund," was started in 2009, and one of their missions is to raise money to help people struggling with addiction. For more information on the Claddagh Fund and the Dropkick Murphy's new album, visit the band's website.